I am 43 so these are words I thought I would never say. When I had Aaron I said I would *have* to have a 2nd by age 40 but as the 40th loomed nearer we weren't at all ready and I never ever wanted to have a double buggy or 2 in nappies. I know my limits and although I can be all like Mother Earth, equally I can be a stress head and know that I couldn't cope with 2 under 2 or even 2 under 3. My ideal scenario was Aaron in reception, with me at home bouncing a baby on my knee. Trying to conceive means Aaron was in year 1 when Lottie was born and in year 2 now. 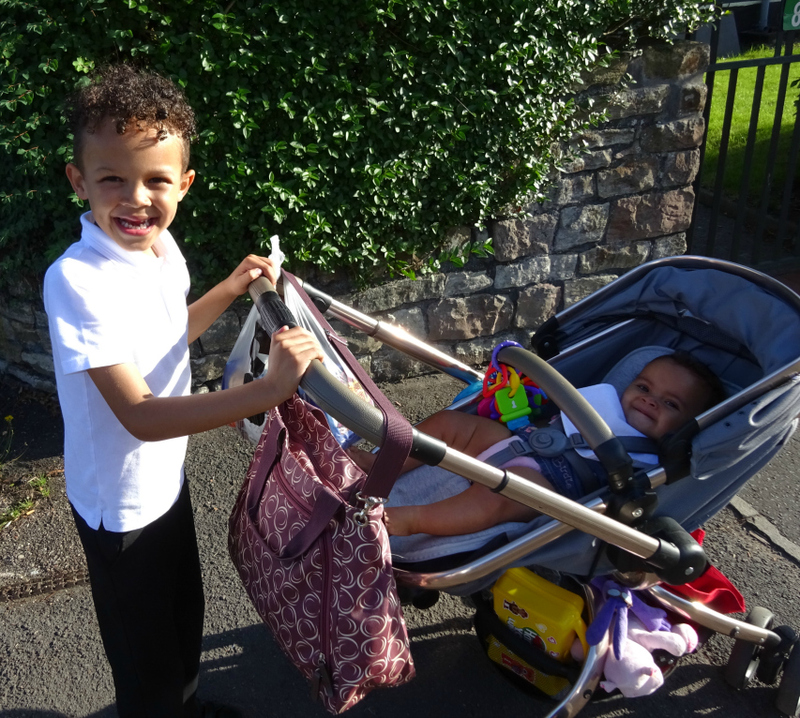 This time round motherhood means getting a baby ready for school everyday and being up and out for the school run every morning in all weathers, but actually it is quite refreshing having that routine, after what I remember it being like as a Mum for the first time. Kind of swimming lost at sea for a while. Yes PND did feature. The truth is, yes our family is complete with a boy and a girl but I am in that "never say never" frame of mind, regularly touting the phrase "if we won the lottery"! Yep! Seriously! 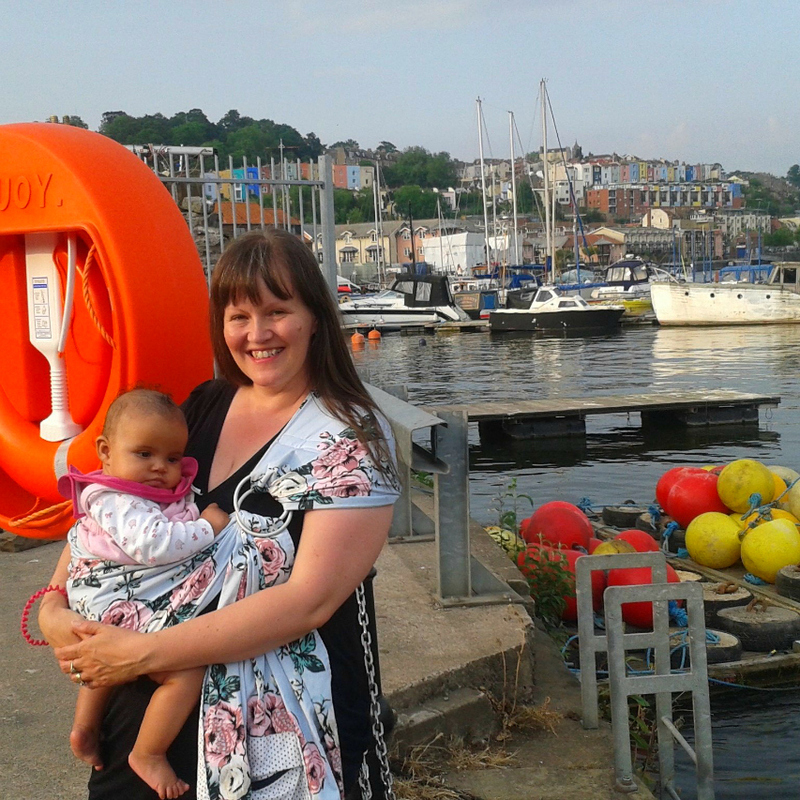 This time there's been no trouble breastfeeding (well not nearly as much as with Aaron) and there's been no postnatal depression and yes, despite my age, I could imagine going through it all again. I felt so alive when pregnant. I did do the early nights thing in the first trimester and did need to get the bus for the school run in the 3rd but only literally in that last fortnight. Until then I was able to walk up to 30 miles a week and regularly did. Which is great because I used to be a yoga teacher and we told pregnant ladies they should walk 5 miles a day. Mother Nature and her need to make us procreate as humanity has made me forget the pregnancy insomnia I suffered from really badly in the final 4 weeks of pregnancy and the butterflies bordering on panic attacks that plagued me too, both at the end of the pregnancy and the beginning few weeks of lil Lottie's life. Gosh it was scary I used to feel like I couldn't breath and regularly had to run out onto the patio. I couldn't sink down into the bath as I felt as if I would drown. The minute the steam would hit my face I'd feel claustrophobic. You wouldn't believe me if I told you what cured it! Oddly enough that wasn't the only thing I suffered from, in this pregnancy that was so different than Aaron's. In weeks 6 to 14 I had morning sickness. I was never actually ill just nauseous but it was even effected by noise (think YouTube soundtracks) AND the Wifi being emitted by my laptop so blogging took a backseat for quite a while. Such a shame as I quite fancied myself as a pregnant vlogger and blogger. What made me remember the above things is I just imagined telling my Mum I was pregnant and I could hear her voice in my head and what her objections would be. The minute my mind went down that road I could imagine her reminding me about the things above. Just having a day dream about that fictitious conversation reminded me of the less glamorous elements of my pregnancy even though broodiness would have me forget them. I'm saying that even though she still wakes to breastfeed about 3-4 times a night. I seem to forgive her for it each morning though. Anyway, once all of my pregnancy and new mum symptoms were dealt with I was finally a glowing new Mum for a 2nd time and could now easily imagine, all too easily, doing it again, if money were no object that is. When Lottie was born my Mum couldn't afford to fly over and kept saying "if I win the Lottery I will". Thankfully we eventually got a cheap flight and her diary synchronised with mine and she DID come in September. It was only from a Friday to a Wednesday so I cannot wait for her to come again especially as her time here was marred by Lottie being rushed to Casualty with a UTI. I'm glad she was here to support me and take Aaron to school while I was in hospital and Daddy was at work. Anyway, I digress. Yes, I would have another baby. But I guess age is not on my side, so I probably would in this case have no choice but to have them close in ages. I used to regularly dowse and dowsing said I would win the Lottery but the trouble is I never ever do it. And as the saying goes "you have to be in it to win it". I got tempted a few weeks ago and I did the Euro Millions in a store but only because the Factory Shop had a sign up saying that it was a win of £150 million that Friday. Would you believe that (1) I don't know where the ticket is and (2) I haven't checked my numbers.... well that's due to (1) ha ha! So I think the best solution with these things is to buy your ticket online as then you get notified if you win right? So Lotto Betting would probably be just the ticket (forgive the pun considering it's online and ticketless) for me. My husband plays the National Lottery twice a week every week and I know he does it online. I know we often joke it is like a second tax. Given how many taxes there are, that number should probably be higher than second too! I already know what area I would like to live in if we did indeed win the lottery. Is it something you dream about? Are there things money limits you from doing? I live quite a simple lifestyle and don't buy designer anything. My well paid job ended Summer 2012 and since then I put my needs last - I know get the violins out. So this Summer I was wearing Birkenstocks that were quite literally falling apart - I really MUST put them in the bin and so it is lovely when I get the odd treat like my makeover with Regatta Outdoors. I particularly like it when blogging achieves the gaining of an item I would have needed to buy anyway, like jackets in that instance as this helps me to be a stay at home Mum for that bit longer. But back to the Lottery. I know one thing I would do is travel with my Mum, as barring a day trip to France she's never been abroad, and in the last 5 years I've not seen nearly enough of her. I'd also assist a few family members and definitely my best friend, who's been living in a caravan on her drive for the past TWO YEARS whilst they refurbish their house with setback after setback. A win would really change everything, but I'd have to remember that possible 3rd baby, before I down too much champagne, or given I haven't drunk for nearly 2 years perhaps I should quit the breastfeeding, down some champagne and then get pregnant. In that order. I don't even need to consult the hubby as he often asks me, with a twinkle in his eye "would you have a 3rd?" and we've been asked it by friends and family too even though they know our age! I know! I was shocked too! Well we've been together since 1988 and we always said we'd have 3 but we started late. In 2018 we'll have been together 30 years. We got married when we'd been together 13 years so this year we celebrated 15 years married. We got married on our anniversary so there's no confusion and just one anniversary to celebrate. Because we got married on our 13th anniversary I had 13 roses in my bouquet. And no! I do not believe that 13 is an unlucky number. Quite the opposite I believe it is a divine feminine number. My bridesmaids dresses were red velvet and my Aunt said it was a Magdalene Red as in Mary Magdalene. I'm delving into my spiritual side here so should sign off before you switch off LOL! I really MUST find that Euro Millions ticket and see if I have won anything! I'll let you know. Or maybe I won't, you'll just notice that I'm travelling more and drinking more. Probably what you will notice is an abundance of interior shots as I move into the home of my dreams.......... oh it is lovely to dream! Lottie would probably react like this if I said she wasn't going to be the baby of the house any longer! 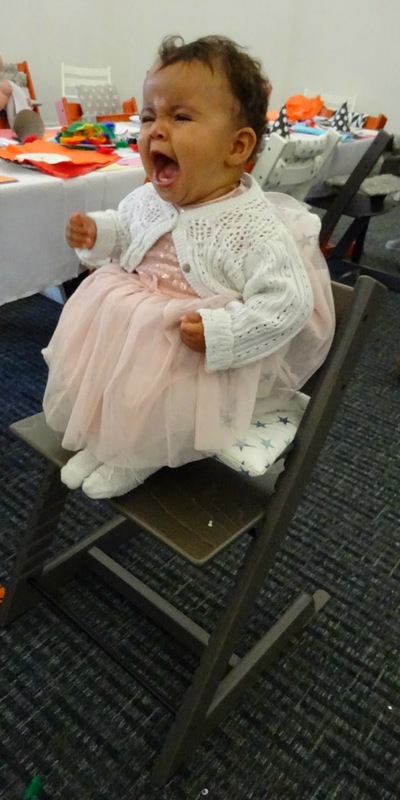 But at least it would mean we'd won the Lottery and could afford to buy the Tripp Trapp chair she is sitting on (at The Baby Show we've just been to)!